Published: Nov. 14, 2012 at 01:55 p.m. Updated: Nov. 14, 2012 at 03:42 p.m.
No matter what Jets coach Rex Ryan says about his team's punting statistics, the Tebow acquisition hasn't worked. The Jets aren't confident enough to play Tebow as a starter. Tebow isn't very effective in his Wildcat role. He's a non-factor. 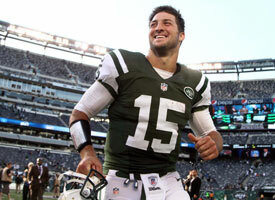 Jeff Darlington of NFL.com and NFL Network says the Jets should just cut Tebow if they aren't going to use him. That's not going to happen during the 2012 season -- Tebow has too much value as a backup quarterback -- but it's an interesting thought for 2013. Will Tebow be around next season? There are a lot of variables here. JetNation.com did a great breakdown of Tebow's contract earlier this year. The short, short version: Tebow is due $2.08 million next season. That's a very reasonable salary for a backup quarterback. If the Jets truly believe in Tebow in that role, it makes sense to keep him. Ryan and general manager Mike Tannenbaum brought in Tebow. Will they be around next season? We would guess that Ryan can survive just about anything for one more season. Tannenbaum -- the architect of this team -- could be in hotter water. It's possible Jets owner Woody Johnson will give both men a pass because of injuries to the 2012 team. A new regime unlikely would want Tebow. That's just usually how these things work. Take a look back at Tim Tebow's career. After one season with Tebow, would the Jets really want to keep him in a backup role anyway? They clearly don't believe in him as a potential starter. They could decide he's not worth the trouble for such a role player. Even though Tebow hasn't started this season, we believe he chose wisely. The Jets were his best chance for a meaningful role. It's not like there will be teams lining up to give him a better opportunity. I don't need to talk to an anonymous Jet to tell you that.